Garmin Forerunner 310XT is a watch for athletes and triathletes and will record track time, distance, pace and with the optional heart rate monitor will measure heart rate and calorie consumption. It is also designed for use in a pool and lakes and will also time your swim, estimate distance and average speed. You can also use the 310XT on a bike, using the optional quick release and speed/cadence sensor. This device can also be connected to a computer for analysis. You can also track your position using British Grid Format or you can get longitude and latitude coordinates. Garmin Forerunner 310XT has been discontinued. The Garmin Forerunner 310XT is a multisport watch for athletes and triathletes for use when running, swimming or on a bike and it is waterproof to 50 metres. It will track your position via GPS and provide all the information you need for your workout. The battery life is 20 hours. The 310XT will record track time, distance, pace, heart rate (optional) and calorie consumption (optional). It comes equipped with a high-sensitivity GPS receiver and HotFix satellite prediction technology. The 310Xt is also designed for use in a pool, the sea or in lakes. It will time your swim and estimate distance and your average speed. It also benefits from a slim design so it will not get in the way when swimming. You can also use the Forerunner 310XT on your bike using the optional quick release and bike mounts. It will record your time, distance, pace and heart rate (optional). With optional ANT+ wireless technology you can optionally use the speed/cadence sensor or power meter for gathering advanced cycling data. Furthermore optional wireless heart rate monitor will track beats per minute and calculate calorie consumption meaning you can monitor your level of exertion and improve your fitness. 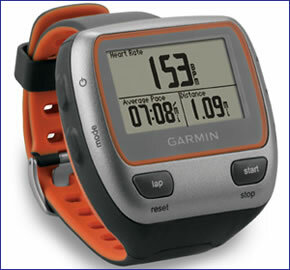 The Garmin 310XT can be bought as two different models. These are the watch only or the watch can be purchased with a Soft Strap Premium Heart Rate Monitor as a bundle. Both versions can be selected to be purchased above. The 310XT has the ability to provide sound/vibration alerts for pace, speed, distance and heart rate. This function is perfect when training with headphones on or when in noisy environments. With the ANT+ wireless technology you can use Garmin Connect to transfer data to and from your computer so you can plan workouts on your computer then transfer them to your Forerunner 310XT. You can also analyse, categorise and share workouts on your computer. You can track you position using the British Grid format. Alternatively, you can get the longitude and latitude coordinates for your location.